Skin care, cosmetics, hospital, life science, and whole pharmaceutical industries require water, either for production or CIP, of the utmost quality: free of pathogens and chemicals such as chlorine & ozone. Cooperating with Aquafine – UV water treatment from US and Hydranautics – membrane technology from Japan, Triotirta is ready to help you provide the process water according to your standard. We offer a comprehensive range of water pretreatment to support your total water treatment design that includes: sand filters, activated carbon filters, softeners, iron and manganese removal filter, customized to your water need. Reverse osmosis (RO) unit employs a semipermeable membrane and a substantial pressure difference to drive water through the membrane to achieve chemical, microbial, and endotoxin quality improvement. The process streams consist of supply water, product water (permeate), and waste water (reject). Pretreatment and system configuration variations may be necessary, depending on source water to achieve desired performance and reliability. Supported by one of the world leader of membranes technology, Hydranautics, we are working on your concerns that associated with the design and operation of RO unit include membrane material sensitivity to bacteria and sanitizing agents, membrane fouling, membrane integrity, seal integrity, membrane life, and the volume of waste water. Failure of membrane or seal integrity will result in product water contamination. Methods of control consist of suitable pretreatment of the water stream and appropriate membrane material selection. We invite you to contact TriotirtaCare to get the design that will suit your pharmaceutical water system best. This is the most common application of UV light in water treatment. Ultraviolet energy causes permanent inactivation of microorganisms by disrupting DNA so that they are no longer able to maintain metabolism or reproduce. A pharmaceutical water system could have several locations where UV equipment would be installed. Some typical locations of installation would be post-carbon filter and pre-RO (reverse osmosis). 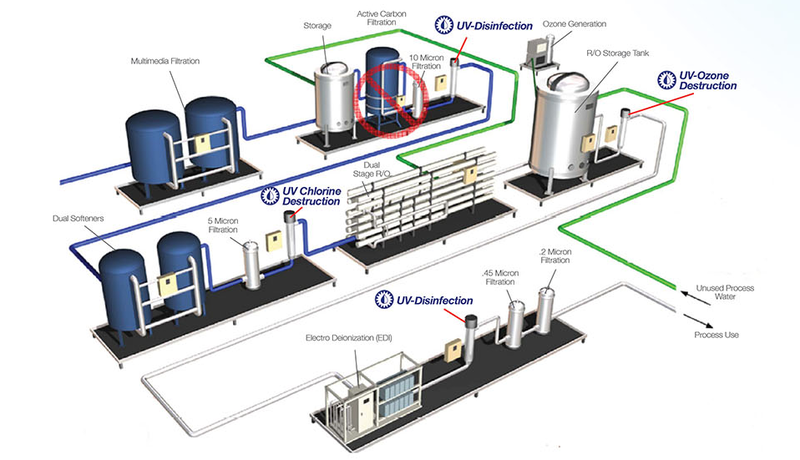 When installed downstream of the carbon bed and or directly upstream of the RO unit, a UV system can significantly reduce the microbial counts by destroying at least 99.9% of the bacteria present in the influent stream. While the addition of chlorine and chloramines to city water may control bacteria levels, they have undesirable effects on the degradation of membrane filtration or RO. But popular methods of removal, such as carbon beds or chemical injection, have proven to be problematic. Sodium metabisulfite involves replacing one chemical with another and creates food for microorganisms, while carbon beds can be inefficient, vulnerable to channeling and provide breeding grounds for microorganisms. Aquafine pioneered the technology of chlorine and chloramines destruction utilizing UV light in the pre-Reverse Osmosis. Ozone is commonly used in the pretreatment area of a water system, as well as for sanitizing process and re-circulating systems. Prior to the point-of-use, the residual ozone needs to be destroyed to ensure the process water is not compromised. After considering the appropriate variables, a properly sized UV unit can be guaranteed to destroy the ozone to non-detectable limits, insuring the integrity of the process and the product. A dosage of 90 mJ/cm2 is recommended for destruction of ozone residuals of 1.0ppm. The USP 31 regulations require an upper limit of 500ppb for TOC for both USP Purified Water as well as for WFI (Water for Injection). Aquafine uses a powerful 185nm wavelength appropriately sized and designed to meet this application.